The absolutely brilliant things about a motorhome adventure are the endless opportunities to tailor your itinerary to suit your interests and the spontaneity of being able to stop or move on whenever you choose.You can write your own itinerary – you don’t have to stop and tour a chateau if it is going to stand in the way of a perfectly good wine tasting or go cheese tasting if you would rather be cycling along the Tour de France route or swimming in the river instead! You can put on your scruffiest shorts and light the barbecue for a DIY gourmet feast or dress up and head for the nearest Michelin starred, chateau restaurant.It is totally up to you how you spend each day. Start early, start late, stop for a snooze or press on all day to cover the miles, pack in as many tourist attractions as you can or find a hidden village and potter about there all day. France can present quite a challenge when it comes to figuring what to fit in during your visit. As the world’s number one tourist destination it is no surprise that there is a lot to see and do here so deciding exactly where to go and what to try and achieve in a single trip is never easy. Wine regions generally offer some of the most spectacular scenery and architecture you can find so even if you are not motivated by the free wine tastings, touring a wine region will take you through some splendid areas and many excellent itineraries have already been created for you to follow. If you are touring a wine region in a France Motorhome Hire vehicle you will also be able to stay at vineyards overnight at the invitation of many winemakers though our membership of the France Passion scheme. If you plan to really enter into the spirit of the wine tasting and stay overnight at the vineyard just remember to pick up some local cheese and fresh bread en-route or call into a local “traiteur” (sort of a delicatessen that makes meals ready to heat and serve) and pick up a regional speciality for supper. 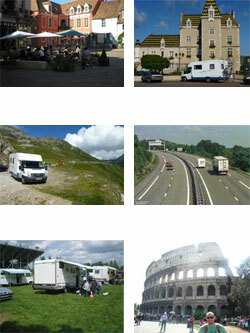 Whether you are following the Tour de France as a keen spectator or taking part in the European Model Aircraft Championships, going to Le Mans to watch the Moto GP or competing in the Monte Carlo Rally, a motorhome will offer you the perfect combination of transport and accommodation all in one. Just bring everything you need with you, pack it into your motorhome once then hit the road and follow your sport as it moves around or stay a stone’s throw from the venue where it is taking place. Everybody is inspired by different aspects of a visit to France so why try to book a “one size fits all” tour? Just like the wine itineraries, the tourist boards for each area of France can suggest a fantastic selection of tours to help you discover the treasures of their region. If you know which region you want to tour just search for their official website to discover the mine of information available. If you’re not sure which region to visit, take a look at this site for inspiration: us.franceguide.com.